To increase the efficiency of my canister stove, I purchased a windscreen. 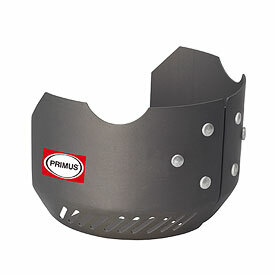 I opted for the Primus Universal Windscreen since it was made with canister stoves in mind. This windscreen has lots of ups and downs. It is definitely a conversation piece. On a short note, it doesn’t necessarily block out lots of wind, but it does help cut down some of the wind. However, it is very light weight and packs very conveniently, right around the actual canister. It requires no maintenance and is very simple to use. To read my full review of the windscreen, go here.